I recently signed up for a beauty subscription box, just to try one out, and I conveniently received another Pacifica nail polish, after having just tried out their new polish line last month. Hey, it’s a red one, which is totally my cup of coffee! Red Red Wine is a gorgeous deep red cream that stops short of being a vampy polish. It’s exactly the kind of red I love, especially now that cool weather is just around the corner. I was surprised to see that Red Red Wine has a flat brush à la OPI’s Pro-Wide (which I don’t like because it is too big for me). It isn’t quite as large and cumbersome, though, so I am OK with it. The other Pacifica polish I tried, Abalone, doesn’t have a wide brush. Red Red Wine applied pretty nicely, with no bubbles or streaks. It is a thinner formula, however, and after two coats, you can see in the picture that it is still not fully opaque. I personally like my red creams with a luscious consistency on the nail, so I am not thrilled with this. Three coats is better, but let’s be honest, that’s kind of a pain! The color, on the other hand, is fantastic. It’s like black cherry juice. Love! I can’t see this not working for most skintones due to the deepness of the color. Pacifica 7 Free Nail Color, 0.45 fl. oz. / 13.3 mL. MSRP $9 US/CA (I do appreciate the price not being jacked up in Canada! Yay!). 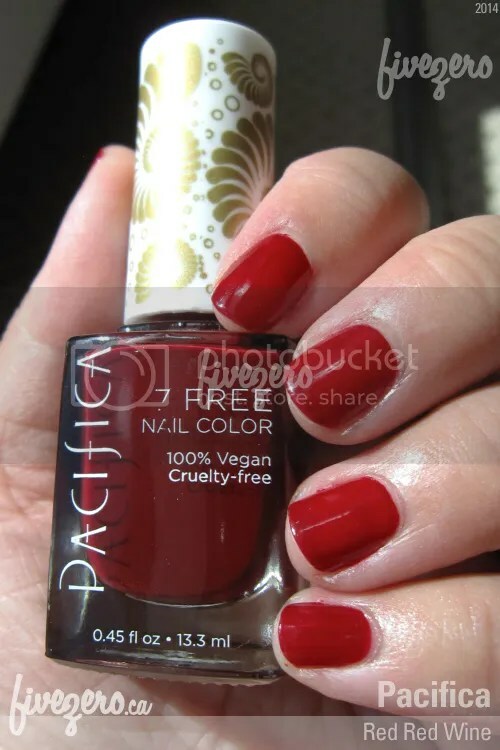 Pacifica nail polish is vegan and cruelty-free. It does not contain parabens, phthalates (dibutyl phthalate), toluene, xylene, camphor, formaldehyde, and resin.